Wenol® is widely used as cleaner and polish for electron microscope applications, ion beam systems, vacuum coating systems and general lab applications. Wenol® has been originally formulated for use on hard metal surfaces such as stainless steel in laboratory, production, automotive, and domestic settings. It can be used to clean and polish hard metal parts for vacuum systems. The carrier fluid dissolves in most hydrocarbons and is easily removed. Wenol® is petroleum based and does not contain silicones. One needs to exercise care when used on soft metal such as aluminum. 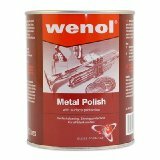 Note: Wenol® is manufactured by the same manufacturer as the discontinued POL polish. Both products share the same formulation but have a different packaging. The many users of POL polish will find that Wenol® will give the same satisfactory results. The polishing compound in Wenol® is aluminum oxide. The original formulation of UNIPOL® is very similar to POL and Wenol® It is now available as an alternative to POL metal polish (which has been discontinued). Many users of POL have switched to UNIPOL® and have found that UNIPOL® will give the same performance as POL. It is widely used as a cleaner and polish for electron microscopes, ion beam systems, vacuum coating systems, substrates and general lab applications. UNIPOL® has been formulated to give optimum results on hard metal surfaces such as stainless steel or chromium coated surfaces. It performs very well as a cleaning polish for Wehnelt cylinders. UNIPOL® is petroleum based, does not contain silicones and dissolves in most hydrocarbons. It is not recommended for use on soft metal such as aluminum. There are four Pikal® products, all based on the same abrasive polishing compound. Each product has it's own special application, sometimes overlapping. 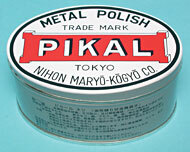 Pikal® Polishing Paste is a thick paste with a high content of solids (abrasives) and is supplied in a tin. Yields good results in instrumentation cleaning and surface finishing in manufacturing. Can be used to remove "hard" stains on metal, glass and enamels. Also used for precision polishing of parts with a narrow tolerance. Can be used on buffing wheels. Widely used to clean vacuum systems, deposition sources and stainless steel chambers. Can be applied to wipes or cotton swabs for polishing. Test first when used on softer materials such as copper, aluminum and soft metal alloys. Pikal® Care is formulated as a thinner paste, supplied in a tube and is specially suitable for stainless steel products and surfaces. Can be applied directly on the products and polished with wipes. Pikal® Liquid is an emulsion for gentler polishing of a wide variety of materials such as brass, stainless steel, copper, aluminum and plated surfaces both with flat and curved surfaces. Pikal® liquid is supplied in a can and the emulsion may be applied directly on the product to be polished or via a polishing wipe.